Hand Hygiene Saves Lives, But Is It Realistic For All Nurses? Is proper hand hygiene possible in all healthcare settings? What about the countless nurses, nursing assistants, home health aides, and volunteers who work in long term care, private duty, home health, and community-based settings? Ensuring good hand hygiene for nurses and other healthcare workers who are employed outside the hospital is a complex problem with no easy resolution. As healthcare workers, we all know that proper hand hygiene saves lives because it greatly helps to prevent the spread of microbes that cause lethal diseases. Reputable entities such as the Centers for Disease Control and Prevention, the World Health Organization, and numerous other health-promoting groups all extol the benefits of good hand hygiene. 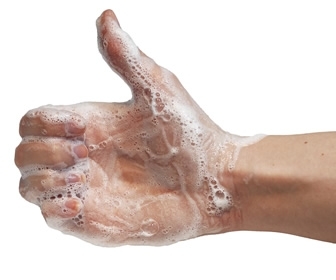 Is proper hand hygiene achievable in all healthcare settings? I know that the knee-jerk reaction to this question from many people would be a resounding "Yes!" However, I suspect that the vast majority of those who believe it is possible to maintain proper hand hygiene in all types of locales have never worked outside the acute care hospital. Proper hand hygiene is very much doable when a nurse is caring for five to seven patients on a medical/surgical floor, has alcohol foam pumps in every room, and abundant sinks throughout the hospital. But what about the nurses who work in long term care, home health, private duty, or community health settings? I worked in long term care (a.k.a. nursing homes) for more than six years. During the night shift at one particular facility, I routinely cared for 68 residents with the help of three nursing assistants. The infection control staff at most healthcare facilities recommend that workers perform hand hygiene before entering every single patient room and upon leaving each room. Let's assume that I entered each resident's room twice during the course of a routine shift. This would amount to four occurrences of hand hygiene per resident. Four hand-washings or alcohol gel rubs multiplied by 68 residents would equal 272 instances of hand hygiene. In case you're wondering, this was not feasible during the course of one 8-hour shift due to time constraints combined with the skinned, painful hands that would have resulted. Nurses who work in home health and private duty also face some of the same challenges, even if they only provide care to one patient at a time. Some patients cannot or will not keep hand soap and paper towels inside their homes. In these cases, it is up to the home health nurse to supply his or her own soap, towels, and hand sanitizer to maintain proper hand hygiene. Once in a blue moon the home health nurse may encounter a patient in a rural area who has no running water. On occasion they might be assigned to a patient whose dwelling has no hot or warm water due to the natural gas or electricity having been disconnected. In these instances the nurse would need to use alcohol gel rub, hope for the best, and wait until they leave the house to perform a complete hand-washing at a venue with a public restroom such as a gas station or restaurant. Achieving proper hand hygiene for nurses who work outside the traditional acute care hospital is a complex challenge with no simple solutions. However, healthcare workers who work in other settings can do the best they can with limited resources. Increased staffing and thorough education on infection control practices are helpful in long term care settings such as nursing homes and assisted living facilities. Home health companies and private duty agencies may consider providing detailed infection control education and supply employees with kits that include anti-microbial soap, paper towels, and alcohol-based gel rub or foam. Hand hygiene prevents illness, injury, and death. With appropriate education, adequate staffing, and abundant supplies, proper hand hygiene can become a reality in all types of healthcare settings. Hand washing protects us and our patients. Let's step up to the challenge. I just wanted to comment on the HH/private-duty nurse thing, because in my experience you usually do find the "bar soap from hell" in people's bathrooms. Yes, complete with grimy fingerprints, embedded in a gelatinous funk. Most of us bring pump soap and paper towels. In a pinch, there is dish soap and air/shake drying. I think statistically, there are fewer infections in homecare settings but you are so right about the "variety" out there! In Alaska we actually have a surprising number of people who live in dry or semi-dry cabins. That means they may have no running water and they may have an outhouse. Hospice and HH staff carry their own hand hygiene products with them and tend to use the sanitizer whenever appropriate. Yes, they use the outhouse even when it is -40. You still believe that proper hand hygiene is possible, even for the LTC nurses who must provide care for 50+ residents within the time constraints of an 8-hour shift? My employeer home health agency provides hand sanitizer and papertowels as part of our basic trunk supplies which we can restock as needed-shipped directly to our homes or office. *Are there any reliable studies of % of staff compliance, vs. efficacy, correlated with Infection Control statistics, carefully controlled and observed? Of course, I don't know the answer to this, but experience suggests it's unlikely. Experience suggests voluntary staff compliance likely doesn't exceed 11.82%. Management enunciates pronunciamentos, there does not appear to be any followup, and staff compliance remains below 11.82%. (The Infection Control Nurse, apparently lacking specific experience (and none is provided by management) becomes a suit upon appointment; and works M~F, 9~5.) The system appears to be set up to ignore infection control practices outside these 40 hours per week. Is it achievable? Almost certainly, yes. Is it likely? Almost certainly, no. Does anyone care? Well, . . .
DanidelionRN has 8 years experience and works as a Med Surg Travel RN. I think that when it is not possible, the fault is that of the LTC facility. For example, if my previous employer, an SNF, had installed disinfectant foam/alcohol based hand sanitizer inside of, or outside of each patient room, I guarantee I would have been "foaming in/foaming out" the way that proper protocol expects here at the hospital I now work at. Instead, they figured that the sinks in patients' rooms would suffice, and that we shouldn't have any trouble washing our hands.... forgetting, of course, that patients do not always leave their sinks accessible- some patients probably almost never washed their own hands, have the sink piled with personal items, or in other cases, there might be two wheelchairs and a walker all in the room, in the way of the sink. Sometimes an alcohol hand sanitizer in my pocket was the only way that my hands got cleansed for several hours in a shift at my old job. When I worked in home-care, though, the homecare agency would indeed provide paper products, hand soap, and even toilet paper, to replace what was used by the nurses. Hand hygiene is something that must be ensured by design in a facility's layout and locations of hand sanitizers.... not just rhetoric spoken to the nurses and blaming them when it's not 100% possible. In addition though: Despite what I was told in nursing school in the past: Alcohol based hand sanitizer actually kills germs BETTER than soap and water, and unless you have physical dirt/body fluids/etc on your hands, alcohol hand sanitizer is the preferred cleanser, and apparently, it is statistically easier on your hands, as well. Of course, use of a good moisturizer that is compatible with your facility's gloves is a necessity! It can be achievable, even in LTC, if a fast drying hand sanitizer is made convenient. We've got hand foam outside EVERY door and inside EVERY room. This is a hospital. My unit in particular has been singled out for GOOD hand hygiene. The biggest reason? Our manager responds to EVERY request to add a hand sanitizer dispenser or fix a broken one. So it's always convenient. Which turns it into a habit. But if I had to actually WASH my hands? Or go down a hall for sanitizer. Or open a bottle of purell instead of reaching over and a quick pull to get some hand foam? Oh hades no! It would be like the days when I did work LTC, and I can guarantee, was not as compliant then! Of course, use of a good moisturizer that is compatible with your facility's gloves is a necessity! CeraVe cream is the BOMB. Can't use it at work, but I use it religiously at home. Keeps my hands healthy to handle the shifts.